Warm up winter with a platter meant for hospitality. 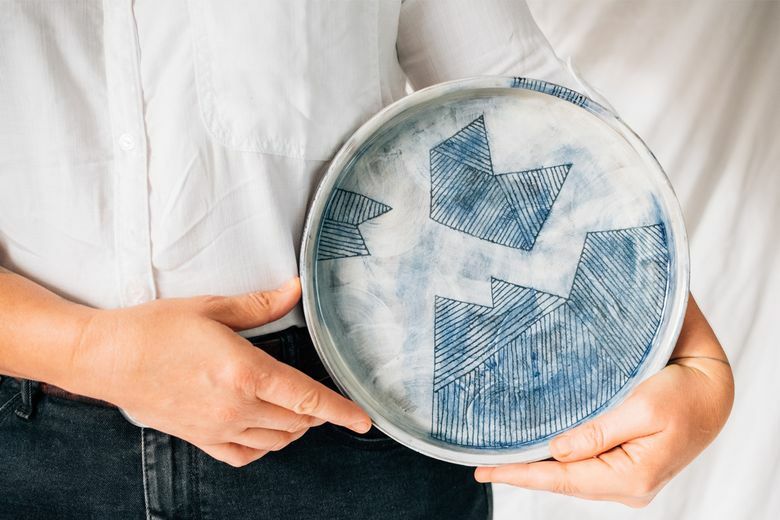 Entertain friends — or break that alleged Seattle freeze — with a dinner party featuring Saltstone Ceramics’ Mountain Platter, made by hand by artist and Saltstone founder Sarah Steininger Leroux. Measuring 10 inches across with a 2-inch-tall edge, the dish is ideal for serving up social nibbles, such as appetizers, desserts, and coffee or tea. Each of the platters, available at the Wallingford gallery, are made from dark brown stoneware with white slip — and no two pieces are exactly alike. Through a technique called sgraffito, mountain designs are carved through the slip, revealing the clay below. Tinted in a vivid dark blue, the finished pieces are oh-so Northwest-chic in design and in purchase — after all, what’s more Seattle than investing in your local crafting community?